Ray Nagin: The New Pat Robertson? It’s Katrina Remembrance Week in most American news outlets, which means if you were in a coma this time last year, you can see what happened in New Orleans. There was a big hurricane that exposed lots of governmental and infrastructure weaknesses, and the city is still rebuilding. So, if you want to know what’s happening this year, you’ll need to wait until next week when Good Morning America and Brian Williams have left The Big Easy. 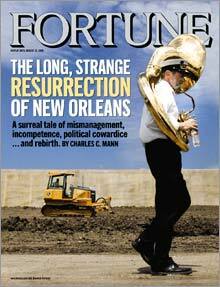 I just finished a great article in the new Fortune Magazine about New Orleans’ attempt to rebuild and how the process is equally as replete with bureaucratic fumbling as it was in the week of hell after the storm hit. Commissions, citizens groups, businesses, politicians – all of these folks collide and what is lost is the individual and his or her family, scraping by, trying to reclaim their life and neighborhood in a world that is daily growing less definite. And in the middle of all of this (and getting lots of airtime this week) is chocolate city advocate, Ray Nagin. After the disaster a year ago, I was pulling for this guy. I was hoping he could come through with Giuliani-like smarts and action. I was hoping he could offer comfort and resolve and get New Orleans back on track as a crucial port, a tourist destination, and thriving city. Then he started to open his mouth. He told people to come back, then he told them to leave. He said thousands were dead, he pointed fingers, he pleaded for more resources, and he got on TV. In January, he wanted New Orleans to be a ‘chocolate city,’ which I wrote about here. And last night, I caught the 60 Minutes clip where he pointed the finger northward, as if he were on some gradeschool playground, calling out New York for not having rebuilt the World Trade Centers already. The comment was in response to a reporter asking him why do much debris still littered the Louisiana landscape. Mayor Nagin retorted, the reporter seemed shocked, and I got a headache. Mr. Nagin, New York has cleaned up the rubble. The ‘hole in the ground’ that still is painful for so many to look at is being addressed. New structures will be built. The city is humming again. You and your Jamaican vacations need to shut up. And so, a year later, here’s a guy who looks less like Rudy Giuliani and sounds more like Pat Robertson. Sadly, when Pat speaks and makes a headline, some people get bent out of shape and call him out, but most sigh and look the other way, knowing that the hot air is mainly just for show. But when Rudy speaks, people show up and listen. Rudy’s got some momentum and some clout. People want to follow. And Ray had this potential. He had one hell of an unfortunate situation come his way, one that no one really wants to handle as mayor or president or anything. But, he was dealt that hand, and so far, a year later, Mr. Nagin is about out of political chips. Unfortunately, more harmed than his personal political capital are the people of New Orleans, the people who need help and answers. So, even though I think the news coverage this week is overkill, I will be watching to see if a city really can rebuild in the wake of such a national disaster. But, I will no longer be listening.